Education is an important job deep rooted in the culture of a city, and the education of language is the basic ability in learning diverse cultures. Kaoshsiung’s education system is forward looking, diverse and beholds an international outlook particularly in the learning of language. Targeting students of different potential and ages to develop a full-scale and cohesive education system, to provide students the gradual learning of different languages. Not only does it penetrate deeply into the language of their mother tongues, it further encourages the improvement of English and other foreign languages. The term “local” refers to the Minnan, Hakka and indigenous groups living on this land, and “local education” refers to the learning from diverse educations, enabling the people to know more about the local culture. Not only does the vast Kaohsiung area have the tolerance to explore an array of cultures, it too advocates the interaction of cultures and eternal continuation. Therefore, compared to other counties and cities, Kaohsiung’s system development of local education is evidently more complicated, yet also more adequately equipped. From kindergarten to high school, the Education Bureau of Kaohsiung City Government has planned out different levels of education content targeting different learning stages. Furthermore, it uses the best learning environment and subsidies to encourage schools to promote the education of local languages and culture. The government hopes to strengthen students to not forget their local culture, and uses local education to lead the next generation to admire the culture of their mother language, to be proud of it and to promote it globally, letting others see the beauty of Taiwan’s culture. The job of local education must begin from kindergarten, including local language and basic conversational ability, teaching of local language singing and local language reading competitions and etc. Little children that first start learning are unable to speak the local language fluently, however, a natural and happy way of learning in training the children’s basic language expression is incredibly important. Letting children be exposed to a local language at an early age, makes them interested in the culture of their mother language and start paving the road for deeper local education in the future. Once they at the elementary to middle school stage, local education can further extend in a multitude of ways. Three elementary- and middle-schools in Kaohsiung have established a language teaching resource center. They are respectively--the Minnan Language Teaching Resource Center owned by Jian-Guo Elementary School and Kaohsiung Municipal Hsiao Gang Junio High School, Hakka Language Teaching Resource Center owned by Zhuang-Jing Elementary School and Kaohsiung Municipal Minzu Junior High School, and the Kaohsiung Aborigines Center established by Ming-Jen Elementary School and Cianjhen Junior High School. It is up to the local language teaching resource centers to promote and hold local language and cultural events together, assimilating local language teaching resources and provide schools with relevant resources and becoming the interactive platform for local education. The Education Bureau also actively set up official classes teaching mother languages in various elementary schools where students were required to take up to a number of hours of local language classes every semester, while increasing the number of local education advisors. Each school would arrange a “Taiwan Mother Language Day” and the bureau would set forth to check out the learning situation, and immediately report the promotion efforts or difficulties faced by the school to the Education Bureau for the sake of editing the policy of local education. 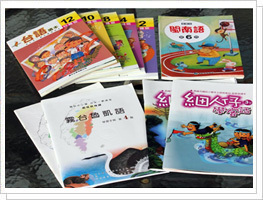 At the same time, editors were publishing a multitude of diverse mother language teaching materials, strengthening the training of Minnan, Hakka and Aboriginal teachers. The abundant and vivid content and exceptional teachers provide students with a better learning environment, continuing the knowledge and recognition of the local culture. In the “2010 National Chinese Language Competition”, not only did Kaohsiung, having spent a long time promoting local culture, win the top three prizes in the Bunong tribal language, the Paiwan tribal language, Zou tribal language, Rukai tribal language and the Seediq tribal reading competition, it also placed second in the Minnan Pronunciation and Font Reading Competition and third in the Hakka group-society group. It is evident that local language education has been fruitful in its harvest. However, local education isn’t just a short term language teaching goal. Rather, it has the mission of continuing culture for generations to come. For example, not only has the Kaohsiung Municipal CiJin Elementary School opened Minnan, Hakka and Aborigine teaching classes, in order to serve to the different territorial and tribal characteristics, two Aborigine teaching classes were also especially set up to enable deeper education of the indigenous people. 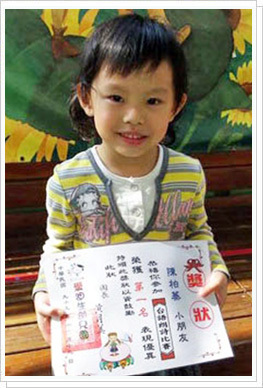 CiJin Elementary School’s own establishment of a “Hakka Life School” has entered its third year, emphasizing the learning of the Hakka language while blending into the lifestyle of the Hakka culture. What’s even more special is, having noticed that many elementary students were the second generation offspring of foreign marriages, the school has opened a “Foreign Country Mother Language Teaching Class” event, and invited Indonesian mothers to teach students Indonesian. These mothers even held meetings with teachers, researching and developing text material, and even taught the students Indonesian dance. The counselors have also actively held a “Foreign Spouse Family Education” seminar as a new communication channel for these new citizens and their families. Having wholly taken diversity into their local education, CiJin Elementary School was awarded the 2010 Local Education Outstanding Evaluation merit. Faced with the far-reaching global village era, whether it is the delivering of messages in tourism, business or international affairs, English has long become the language of the world. For this reason, English conversation is a basic language ability global citizens must be familiar with in order to increase one’s ability to compete globally. Aside from setting up English language learning centers in Fudong Elementary School and Jhengsing Junior High School, the Education Bureau of Kaohsiung's City Government will build "Global English Worlds" in twenty schools in the original Kaohsiung City from the beginning of 2007. 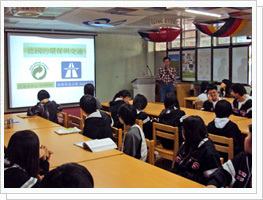 Out of the twenty schools, sixteen elementary, middle and high schools have been set up with an English learning corner, also called "Themed English Village." 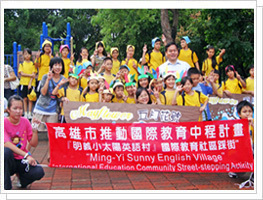 For example, Zuo-Ying Elementary School's themes are stationary shop and movie theater, Yang-Ming Elementary School's themes are immigration and cafeteria; San-Ming, Ling Jhou, Fudong and Taiping Elementary Schools have expanded their corner to become a multi-themed "Integrated English Village." There are high hopes that through the imitation of a foreign language environment, teachers and students will be able to improve their foreign speaking abilities and improve their global perspectives and interactions. On the other hand, Kaohsiung County has divided English education into “themed” and “county-level” English Villages. Twenty-two elementary and middle schools used the school’s small-scale room to set up a bilingual “themed” English village. For example, Tzyy Guan Junior High School took advantage of two classrooms to set up a restaurant-themed English Village, allowing students to pretend to be waiters, displaying their English conversational skills through the method of ordering food. Fengshan, Wufu, Tsaiwen, Gungsan, Chisan and Guopi Elementary School have integrated with the characteristics of their village to form a “county-level” English Village, enabling students to interact in the environment and fully merging English into their lives. The first “county-level” English Village—Tsaiwen Village in Kaohsiung County, planned fifteen themed pavilions, providing English classes for all fifth graders living within the vicinity of the area. These pavilions include Half-Road Bamboo Art Center, Charms of the World Pavilion, Eco-conservation Technology Pavilion, Transportation-themed Pavilion, Lohas Pavilion, and restaurants, bookstores, hotels, post offices, banks, police stations, hospitals and Charms of Taiwan. Everything you need for living, travel and entertainment are displayed here, allowing students to feel as if they have left the country. Lee Tien-Tsai, principal of Tsaiwen Elementary School, believes that not only has the set up of county-level English Villages trained the students listening and verbal skills, it has also enabled those who are financially incapable of going abroad to learn English even without leaving the country. Rose, an English teacher in Tsaiwen Village also says, in the past, students are afraid to speak English when they bumped into a foreign teacher. After three years of hard work, the students take the initiative to greet her in English! Aside from the set up of the English Village, Tsaiwen Elementary School also holds English language tests in school. Through a diversified way of learning, students are trained to be able to listen, speak, read and write fluently. After the merging of county and city, the Education Bureau of Kaohsiung City Government immediately proceeded with the integrated planning of an English Language Village. Scheduled to launch officially in 2011 school year, Kaohsiung will set up ten English Villages in four schools in Kaohsiung City and six schools in Kaohsiung County, and provide fifth and sixth graders to learn and interact with foreign teachers. In continuation of the 2008 school term, Kaohsiung hired 12 Fulbright award winners annually to become elementary English assistant teachers to support the policy. Aside from helping with various English language events, creating English language teaching materials, observing teaching and taking care of performances, these assistant teachers will also teach rural students so they can enjoy the same English learning environment. The Education Bureau is currently in deliberation to appoint foreign English teachers to teach students in rural communities from the beginning of the 2011 school year. That way, schools in remote areas are guaranteed the stationing of foreign teachers and resources, thereby gradually increasing the English teaching and learning resources in their area. By balancing the soft and hard facilities as a standard, the bureau hopes to achieve an equality and ubiquity in the education of the English language. 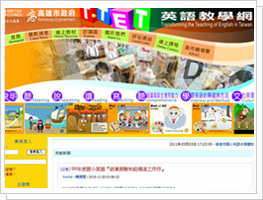 In November 5th, 2010, the Department of Education signed an official agreement with the British Council to set up the “T.Tet English Learning Website”, obtaining the council’s abundant English online learning materials that have been developed over the years. Together, the Department of Education and the British Council set up an English learning resource platform, aiding the teaching of English in Kaohsiung. The British Council released copyrights of four English language teaching websites (Learn English Kids, Learn English Central, Teaching English, Learn English Podcasts) with interactive learning content, enabling English teachers and parents to guide their children through themed games, role-playing, songs and storybooks. This carefree interactive method strengthens English language techniques and provides English teachers with ample teaching resources, and students and parents with diverse learning materials, allowing students to enjoy the fun of learning English even when not in school. In recent years, strengthening the use of a second language has been an international education policy in which Kaohsiung has been actively promoting. Kaohsiung is an international city, whether it comes to holding international competitions, developing international tourism, and even mutual interaction with various countries and cities. All of this requires language abilities as to bridge communication. Therefore, the Education Bureau is granting funding to encourage all high schools to start second language programs that provide ample teaching resources for students to have the opportunity to learn a second language. Currently, Kaohsiung has set up Japanese, French, German, Korean, Russian and Spanish classes for second language learning. There are 153 classes and 4500 students that are currently learning a second language, and will become a diverse pool of talent in the language education of Kaohsiung. In various international functions, these students with abilities to speak a foreign language will have the chance to receive foreign guests, enabling students to use what they learn and be exposed to an international environment early on in their lives, while broadening their perspectives. It should be worth mentioning that there are schools that become sister schools with foreign schools where interaction is done through web cam learning, interview learning and etc. For example, since the beginning of 2009, Kaohsiung Municipal Chung-Cheng Industrial High School has collaborated with Germany’s Delbrück in a student and teacher exchange program. Through the Education Bureau’s secondary school international student scholarship program and the Rotary International exchange student program, two German students were admitted to a short term study in Taiwan. 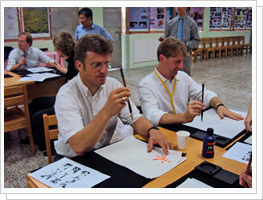 This brought a new trend for students to learn about Germany, and even went so far to establishing the first “German Culture Village” in Kaohsiung last year (2010) in Chung-Cheng High School. Whether it comes to providing students with a chance to visit and study at a sister school, or inducing a new learning craze through the acceptance of foreign students, the study of a second language is definitely the best channel in opening up the interaction of international education and perspective of life. With the comprehensive integration and upgrade of language education, it is not difficult to foresee that the future of Kaohsiung will quickly catch up to the pace of the world. Hoping that through the cultivation and display of the local culture, Kaohsiung would be able to interact and mingle positively with the world while enriching the diverse development perspectives of the city and opening a new path from a global point of view. With broader competitiveness, Kaohsiung will walk in-synch with the world.